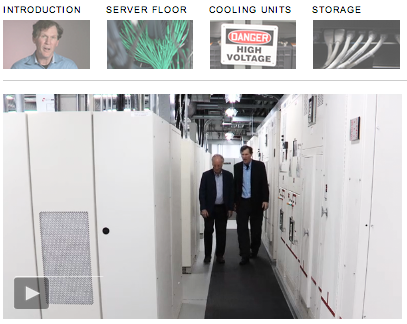 The New York Times took an in-depth look into the world of data centers. These various centers, also known as “cloud factories,” are what house and process the information that we send and receive when we access the Internet. 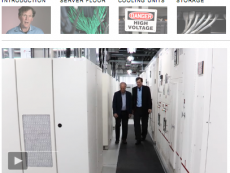 In order to understand how data centers are able to process information around the clock, The New York Times created a video package that takes the user through the operation of a data center. This interactive uses video, photographs, text and audio to walk the user through this intricate process. Narrative audio and interviews, along with the option to choose which part of the story to listen to, offers an interactive and diverse viewing experience. Text on the right-hand side of the slideshow provides users a way to easily digest the information in each video as well as a quick summary of the contents of each video. This entry was posted on Sunday, October 14th, 2012 at 5:34 am and is filed under VIDEO. You can follow any responses to this entry through the RSS 2.0 feed. Responses are currently closed, but you can trackback from your own site.